We gots a package! 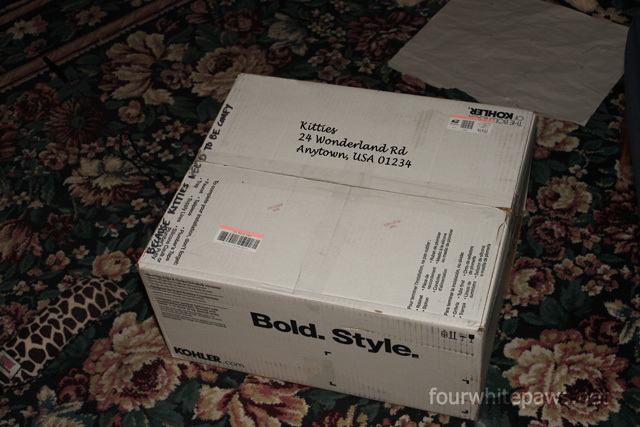 And it was addressed to the kitties, wow! Can you read what it says on the left edge? It says: "Because kitties need to be comfy"
Hmmm, what do you suppose is in this box?? 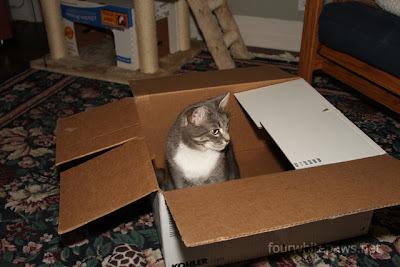 Willow's in the box, but that's only after it's contents were emptied! So, what was in the box? 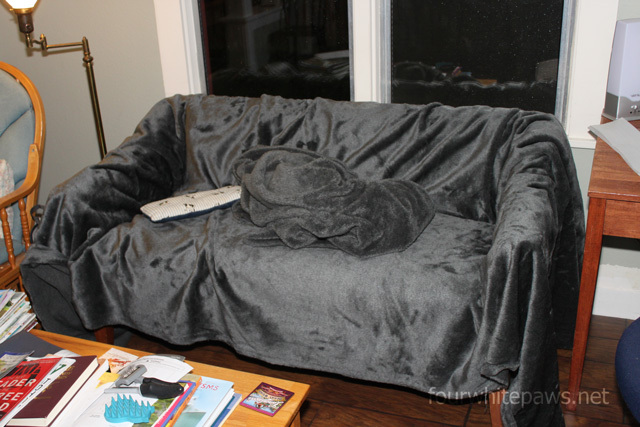 A huge piece of wicked soft thick fleece! I'm a terrible judge of quantity, but this has got to be at least 10,000 yards of fleece! Wowza!! Our dear friend, Lisa and her mom, gifted the kitties with such extravagance. It's destined to be made into a slip cover for the love seat. 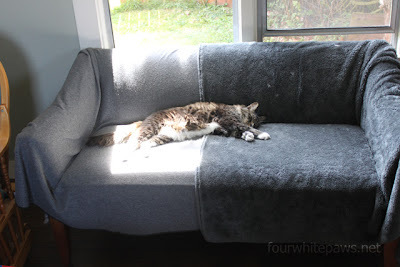 The piece of fleece that used to cover the love seat wasn't big enough to cover it all, which meant a stretched out kitty was only half resting on cloud-like softness - clearly unacceptable! The kitties have been complaining about these horrid conditions for years but to no avail. But now, finally their pleas have reached a caring ear. Now, we need to get the sewing elves working on getting it cut down to size and fitted properly. Wow! Wow is right! Even from the photo, that fleece looks super thick and cosy! That fleece sure looks cosy and nice ! What a wonderful thing to do. I'm sure they will love it. That is beyond fantastic! What a generous and thoughtful gift. What a great gift for the cat's. OH they will love every SECOND that they lay on that fleece!!! May Oliver try it out too? Ooo, I'm coming over to your house., Nothing better to sleep on. That is very inviting! We'll be right over for a test run! 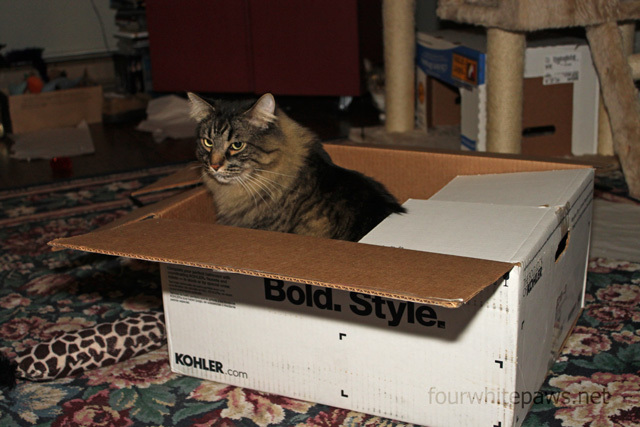 Funny how kitties all love boxes, never mind what comes in them. That looks like a fine comfy cover for them. Great package! To heck with cutting it to fit, all that extra is just more softness to lay on! soooo happy for you! That is going to be sooooooo warm and cozy!! That is a wonderful gift to find in the box. We know where all your kitties will be!